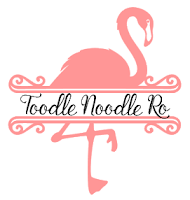 Happy November Toodle Noodle Peeps! Glad you could join us for the Technique Junkies Blog Hop featuring all the new releases for November! If you've arrived from JEANNE's BLOG, you are in the right place! If not, you might want to start at the VERY BEGINNING so you don't miss out on any of the fun! Let's jump in! I have four cards to share with you today. First up is a card featuring Paint Rings and Buy Coffee. 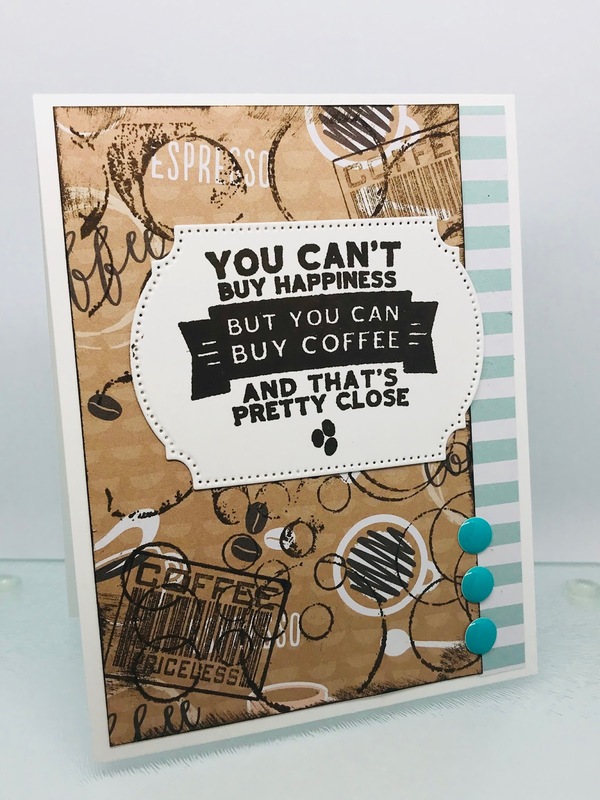 (You will also see a previously released stamp called Coffee Barcode.). On some coffee patterned paper, I stamped Paint Rings in a dark brown. 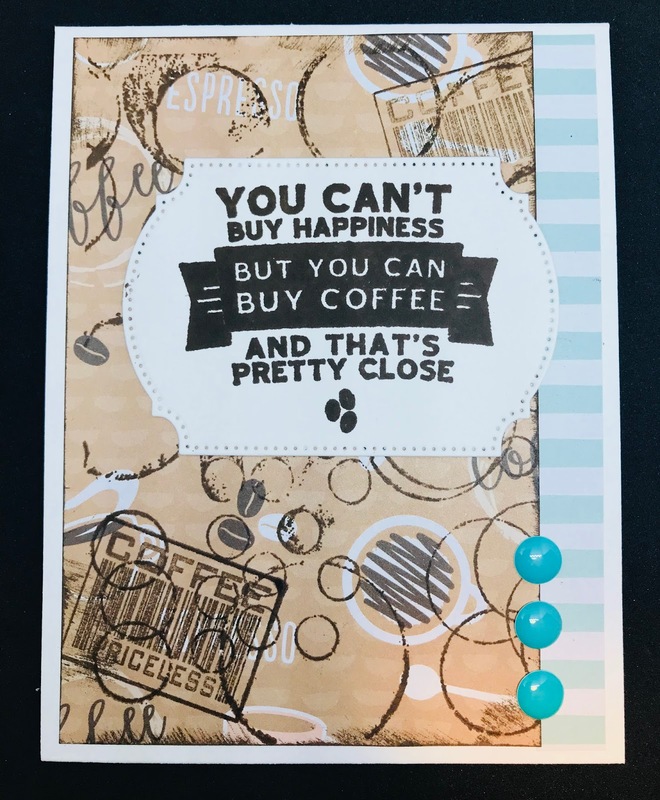 I also stamped Coffee Barcode in a couple of places, then attached a striped piece of cardstock and mounted that to the card base. 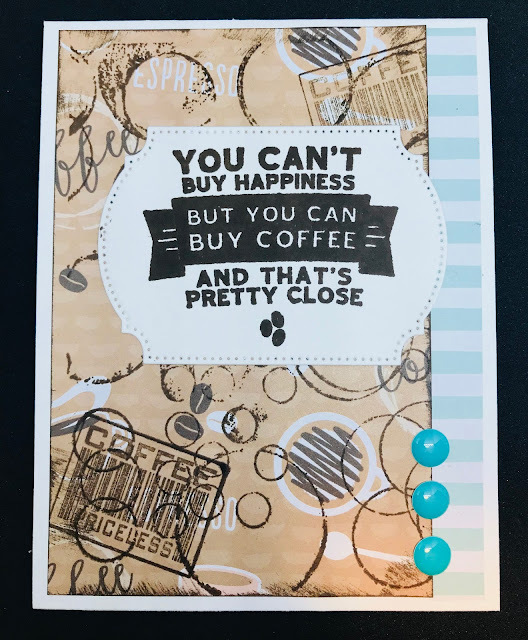 I stamped Buy Coffee on white cardstock and used a die to cut out the label. That was attached to the front of the card and a couple of accents were added to finish off the card. 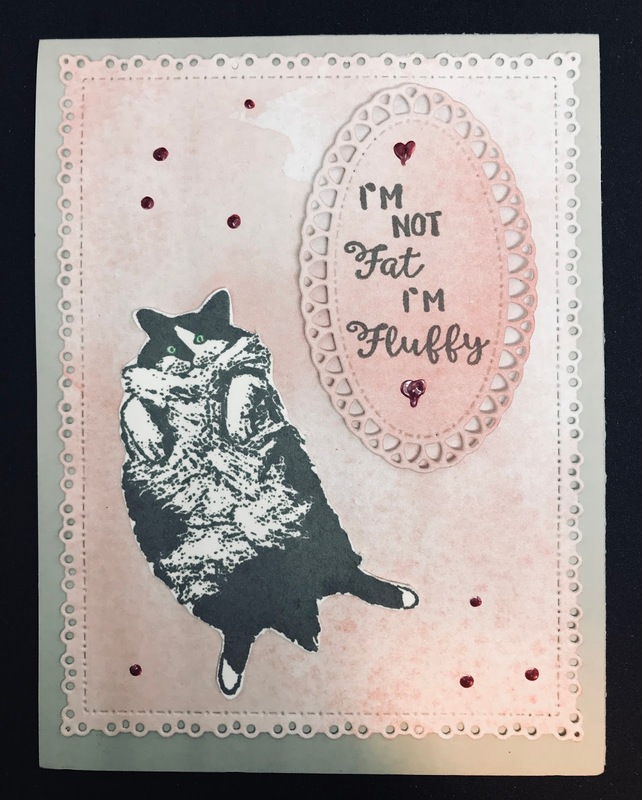 This next card highlights the I'm Fluffy stamp...one of my favorites! The images were stamped and die cut, then placed on a card base. The cat was fussy cut and adhered to the top. My office cat, Ativan, thinks the kitty looks just like her. And she is definitely FLUFFY! How about some stunning eyes? 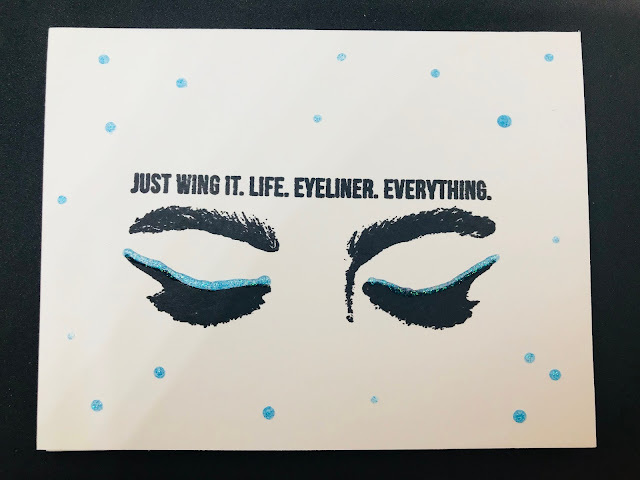 Just Wing It looks amazing on a simply white card with some glitter accents. Just look at that eyeliner! Ooh-la-la! 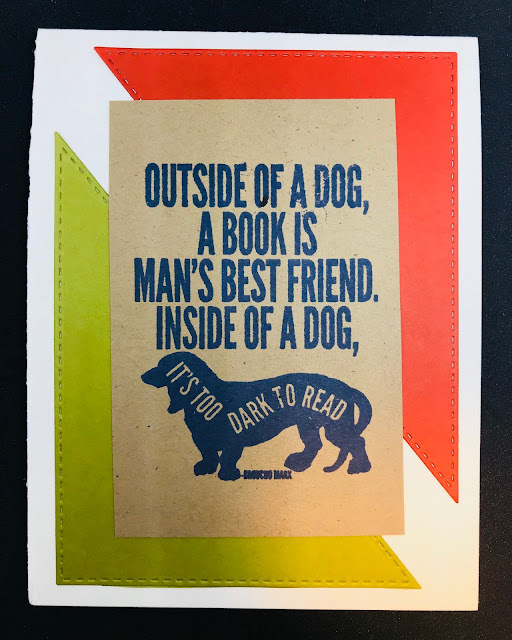 And last up today is an adorable card featuring Too Dark To Read. A couple of simple die cuts and a card base get this card assembled in a snap! Hope you enjoyed the cards I've shown and are inspired to whip some up for yourself. Remember, these new stamps are only on special until November 8th, so don't miss out! 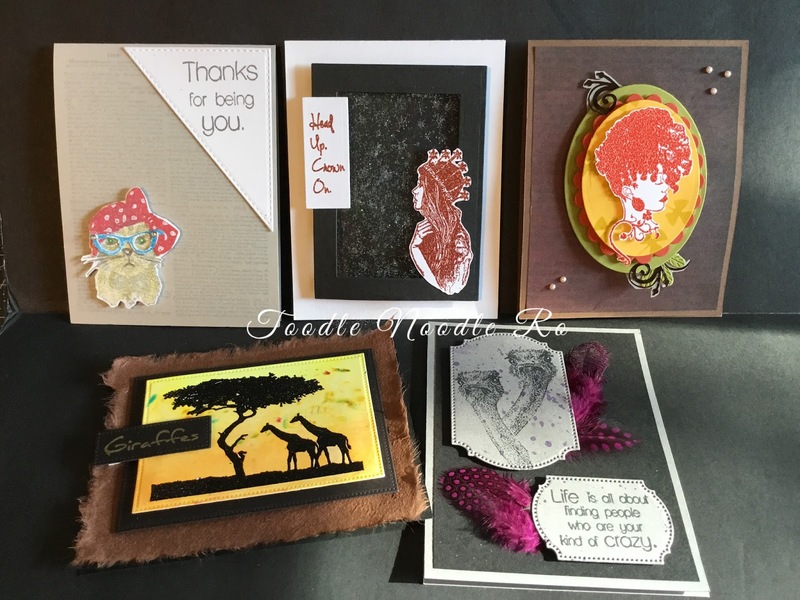 Your next stop on the hop is BETH and she has some great projects to share! Welcome back, TJ Fans! We have some fun stamps for the October Release and I'm excited to be able to share them with you! All the new releases are 15% off until October 8th, so you'll want to shop early! No code is needed, it will automatically be applied at checkout. (And save 10% off any other stamp, any time, by using the code TJ10Ro). If you've arrived from the very creative Jeanne, you're on the right track. If not, you may want to start at the very beginning so you don't miss a thing! I have four cards with five new stamps to show you...let's get going! 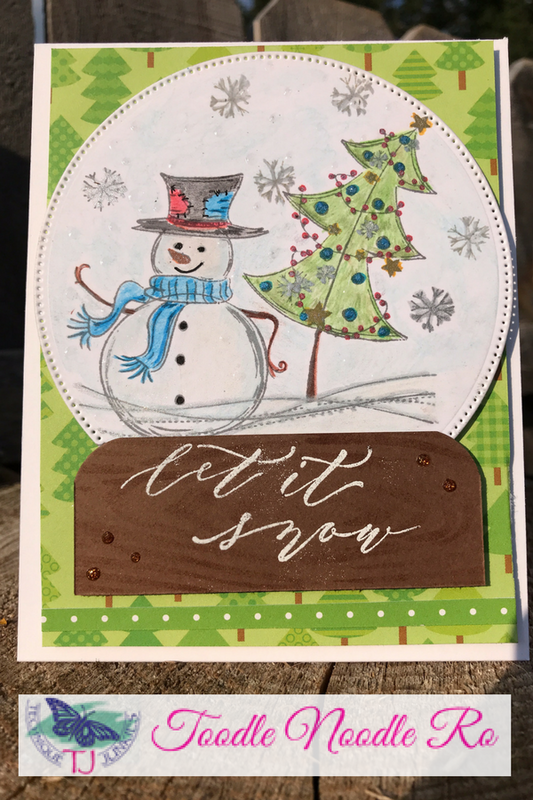 The first card features Let It Snow. Such a fun stamp! I love the whimsy, I love the font, I love the size....I just love the stamp! Of course, you know me, I had to do a little surgery by separating the sentiment from the image so I could place it anywhere on the project or use it alone. It's so hard to see in the photo, but I used Nuvo Glitter Markers on some of the elements to give it a little twinkly pop. I couldn't help but turn it into a snow globe and added some Nuvo Drops for snow. You can see some of the shine better in the closeup. The next two cards feature some very lovely ladies, one of whom I'm sure you'll recognize! First up is Red Lipstick Day. Here's a better glimpse at the image. And to keep her company, another lovely with a fantastic quip! 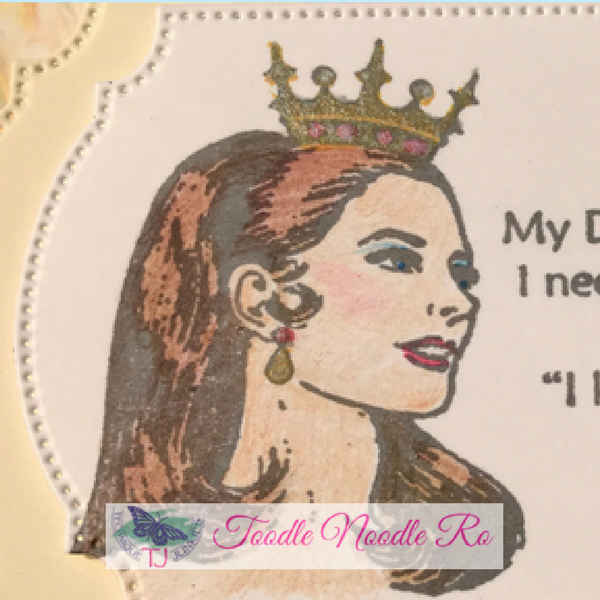 Take a look at Need a Crown! Since I'm am teased about being the "queen" at work (my license plate even says so, as does my parking sign), I am particularly fond of this one! FYI, the background paper is done with the shaving cream technique. Here's a closeup of the glimmer in her crown, again done with the Nuvo Glitter Markers. And last up, Turn on the Light. Such a great sentiment!!! The background is Nordic Knit. I can see using that background for Valentine's Day as well. If you look closely, those are tiny hearts on the background. But turned sideways, they look more patterned and less "heart-y". There are plenty more stamps in the release, as my Design Team Sisters will show you. Next up, the crafty Beth Norman has some great projects to share! 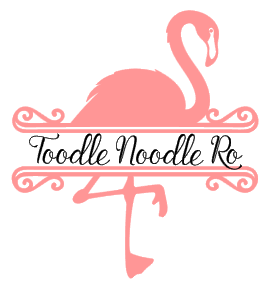 I'll be back with a couple more new projects throughout the month, so visit again! Hello, my friends! Happy Autumn! It's been beautiful here in southern Michigan. The leaves are starting to change. The weather, however, is throwing us for a loop...high 80's and 90's. Unusual for late September. But I'm not complaining. I love the Fall. 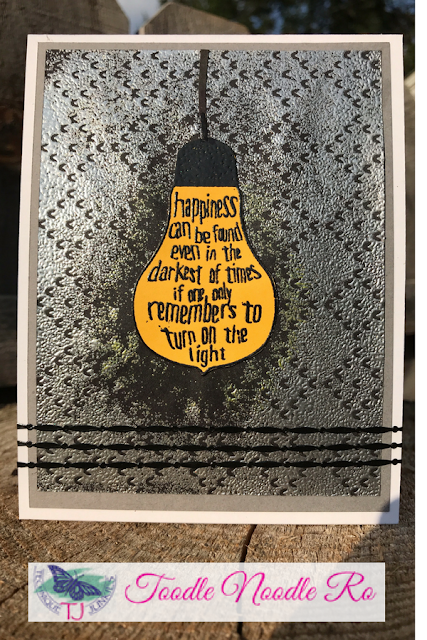 I stamped the sentiment and leaves on the kraft cardstock and colored them in using Spectrum Noir colored pencils. I added some black watercolor splatters and a little of brown marker spray. The panel was attached to a brown card base and the little buttons finished off the card. I love the colors in the card. They just make me happy. I hope this post made you a little happy today too. If you like this set of stamps (or any of the other ones that may catch your fancy at Technique Junkies), you can save 10% by adding the code TJ10Ro at checkout. 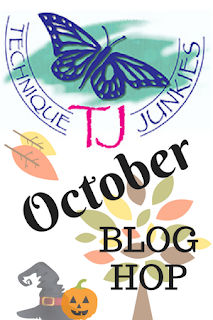 Be sure and come visit me on October 1st for the Technique Junkies New Release Blog Hop! 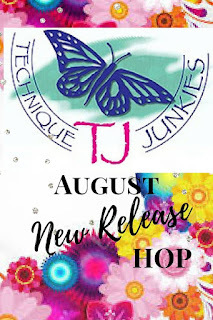 Happy September Release Day, Technique Junkies fans! If you've arrived from Jeanne, you are in the right place. If not, head to the Technique Junkies Blog where it all starts....you don't want to miss a thing! We have 21 new stamps in the Technique Junkies line! We are so thrilled with the new release we decided to do something extra special! 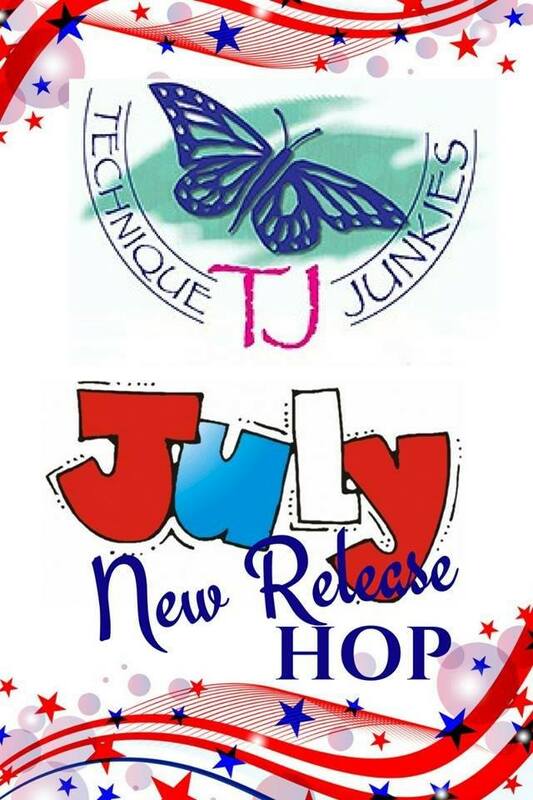 We will be choosing TWO lucky people who comment on this month's release hop - those two people will each win a $100 Technique Junkies gift certificate!!! The more you comment the more chances you have to win, so don't miss a single stop along the hop! Gift Certificate winners will be announced on September 5th. Only one comment entry per blog please. All of the September 2017 New Release stamps are 15% off through September 8th! We can all use a little bargain, right? No codes needed, just put them in your shopping cart and the discount will be applied at checkout. Now onto the fun part. Got three basic holidays covered in one post...running from Halloween to Thanksgiving (or Autumn) to Christmas. First up is a card featuring Skull Frame (S765). It was stamped three times and embossed in different colors on different papers. Each layer was then trimmed out and mounted with foam tape to give it some dimension. 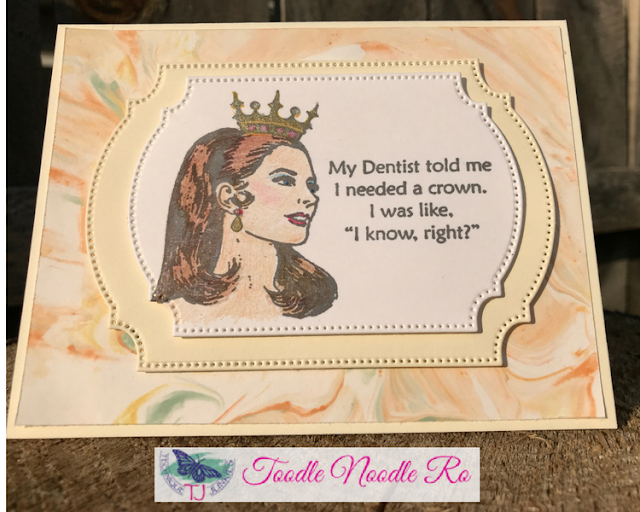 A preprinted sentiment was matted and attached to the front with foam tape, and all layers were attached to a grey card base. Jumping now to Autumn, Beautiful Autumn (SD820) was stamped and embossed in bronze. Watercolors were added to show off the beautiful colors of Fall. A few leaves were punched and adhered to the bottom of the card with a few glitter dots added. Lets start with some beautiful Draped Ornaments (S764). 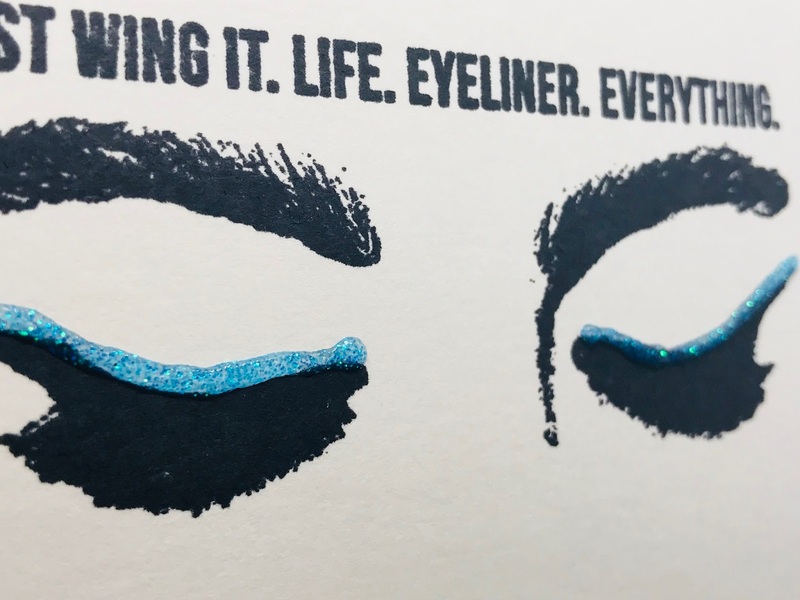 These were stamped oto white cardstock and colored in with Nuvo Glitter Markers. The panel was trimmed and adhered to a white card panel. a pine bough was printed, trimmed, and added to the top. the sentiment is from the new set, Gifts of Christmas (SS081). Speaking of Gifts of Christmas, the next two cards feature two more sentiments from the set of five. The sentiments are so elegant and pretty, they stand on their own as the cards' main focal point. Another fun stamp is Christmas Dog (SD730). I paired it with The Stockings Were Hung (SDX1107) to create a funny card. And I saved my favorite for the end. It was so pretty, I didn't feel it even needed a sentiment. It can be used for any type of greeting. This beautiful Pinecone (SD821) was stamped and embossed in chocolate/bronze. 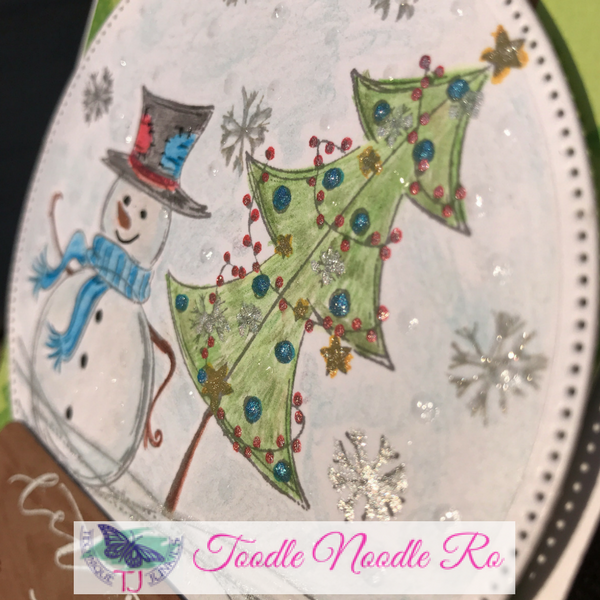 I added some colored pencil highlights and finished it off with a puffy paint pen and glitter to set off a shine snow-like effect. The background is not a new release, but it is one of my wintery favorites, Pinecones (S673). I hope you have been enjoying the hop. Don't forget to leave lot of comments to be entered to win one of TWO $100 TJ Gift Certificates. And remember the new stamps are only on special until September 8th! For any other of the stamps, feel free to use my coupon code and save 10%! Your next stop will be the talented Beth. I am sure you're going to love what she has to share! It's August 1st. You know what that means! 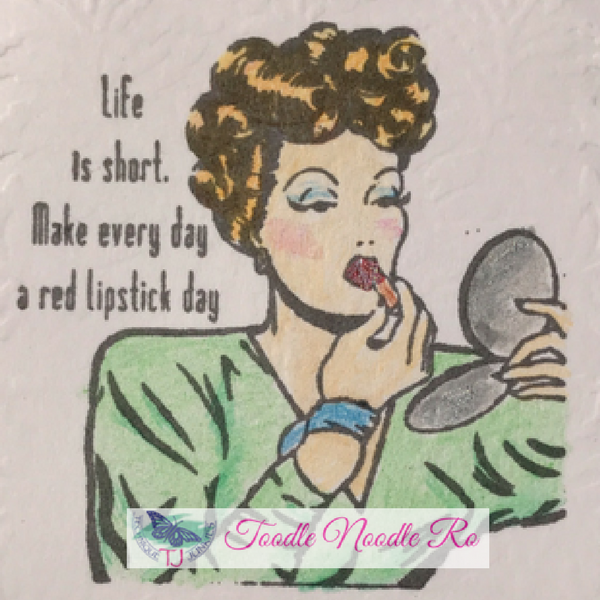 Time to share the new stamps from Technique Junkies! 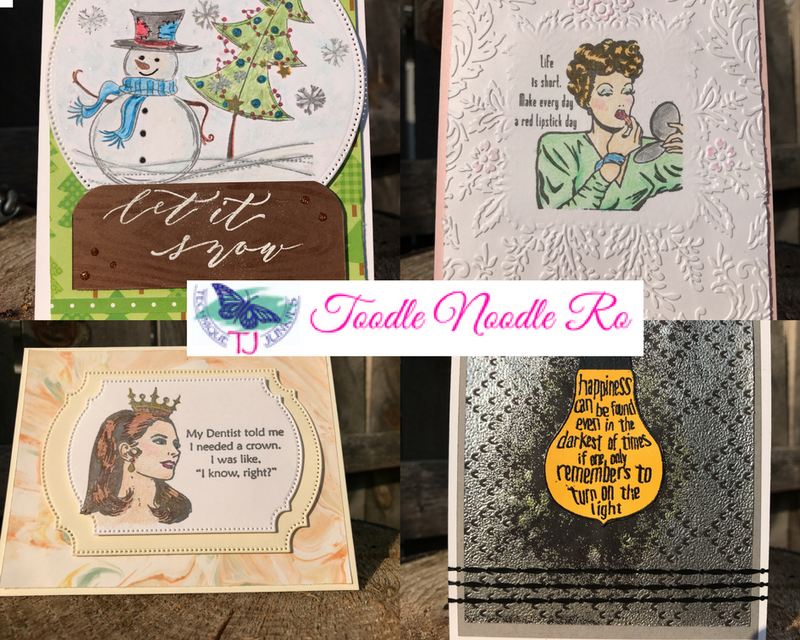 I'm excited to share five cards with you today featuring these fun new stamps! If you have arrived from the very creative Jeanne, you are on the right track! If you've happened here from elsewhere, you may want to start at the beginning of the hop so you don't miss any of the good stuff! Let's get on with the fun! Here are my projects! First up, I created a shaker card filled with glitter featuring the Head Up stamp set. 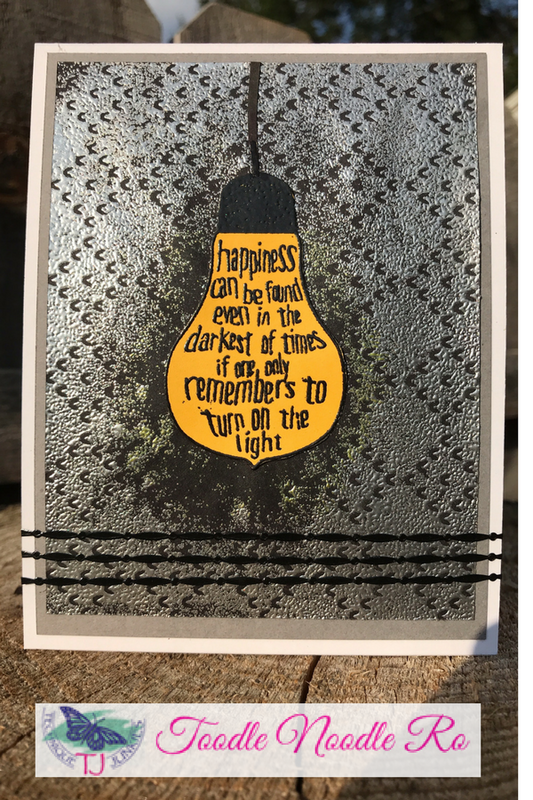 I made a shaker card base then added the fussy-cut image and die cut sentiment which were heat embossed. If you look closely in the background, you will see the back of the shaker element has been stamped and silver heat embossed using the Retro Sparkles background stamp. I absolutely fell in love with the sweet faces of the ostriches in the Your Kind of Crazy set. I admit I did a little surgery on the stamp and cut apart the image so I could rearrange the layout. I stamped the images and die cut the shapes out. After attaching the feathers with glue, I foam mounted the die cuts onto the mat and attached that to the card base. 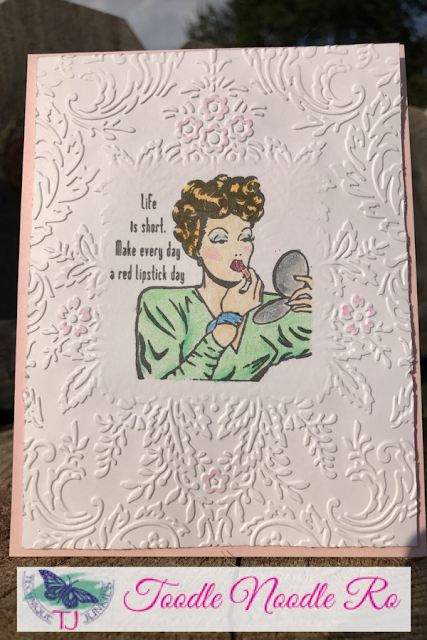 For this next card, I did a little embossing and layering using the Vine Beauty stamp set. After embossing and fussy-cutting the image, I die-cut several layers and adhered them with foam tape. I attached the image to the layers, also using foam tape, and added some vinyl and other elements. I decided to forego a sentiment so this card could be customized as needed. The Savannah Giraffes set inspired me to do a watercolor background. After die cutting the watercolored panel to size, I stamped and embossed the image. The panel was then mounted to a black mat (also die cut) and then to a designer sheet of paper which was torn to size and adhered to the card base. The sentiment was embossed and die cut, then mounted to the front of the panel. And last, but certainly not least, is the Do-Rag Kitty with Thanks for Being You. 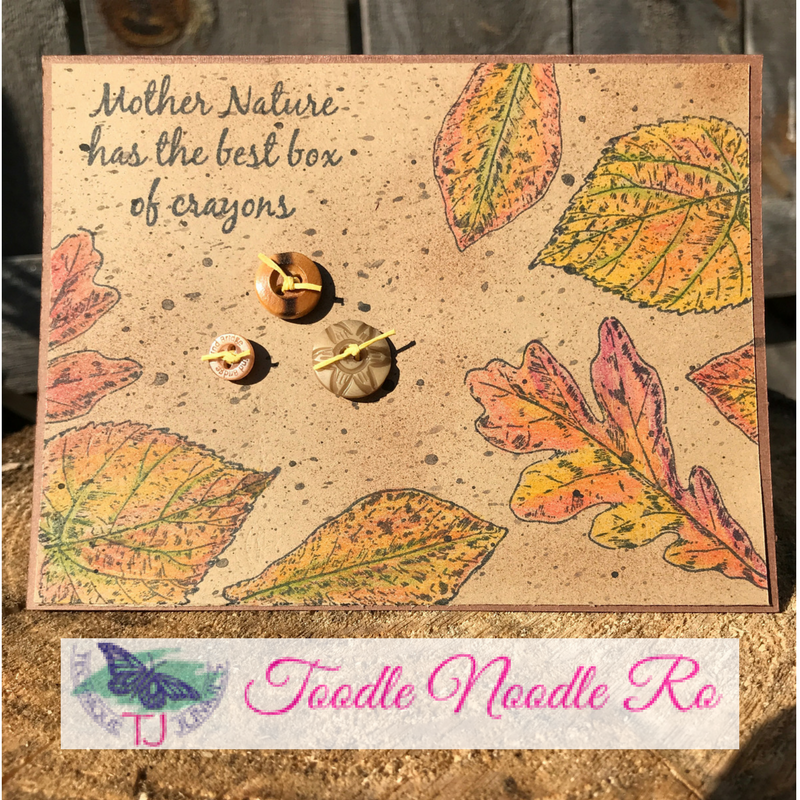 This fun card, while using only a couple basic supplies, makes quite a statement! I stamped and fussy-cut the kitty three times. Once in gray, once in red and once in blue. I then cut the do-rag from the red and glasses from the blue stamped images. I used colored pencil to add a little color to the kitty, then adhered the do-rag and glasses. For a touch of whimsy, I added a couple rhinestones to the kitty's glasses. The scrapbook paper background was added to the card base and the kitty added to the panel. The sentiment was stamped on white cardstock, die cut and adhered to the card. I hope you are inspired to try some of these new stamps and fun techniques. 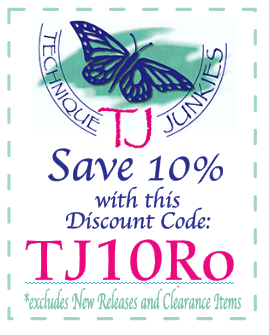 Don't forget, save 15% until August 8th on all the newly released stamps and 10% on everything else using my special code: TJ10Ro. And if you would like a quick link to all the new releases for August, just go HERE! Welcome back, TJ fans! If you have arrived here from the very creative Jeanne Streiff, you are in the right place! If not, you may want to start at the BEGINNING so you don't miss a thing! 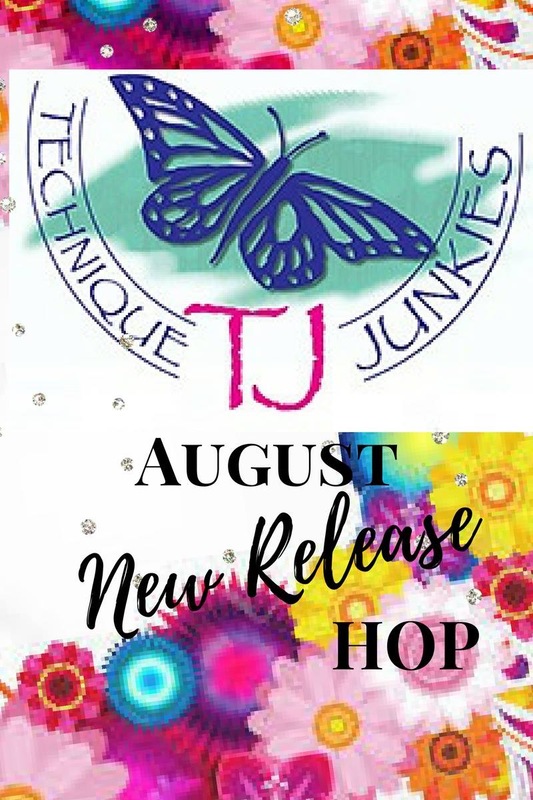 I'm excited to share some projects with you showcasing the July release for Technique Junkies! Save 15% on any of the new stamps until July 8. No code is needed…The discount will automatically be applied at check-out. Now onto the projects! There are SIX of them!! Aren't these new stamps just yummy?! If you would like to see all the new releases, just click HERE! Hope you enjoy the rest of the hop and find lots of inspiration! Your next stop will be the talented Beth Norman!